Composer Michael Kamen carved out a niche for himself as a premiere action composer in the late '80s, launching the musical franchises for both the Lethal Weapon and Die Hard series. His punchy action and ominous string suspense writing brought a unique sound to the budding over-the-top action genre. 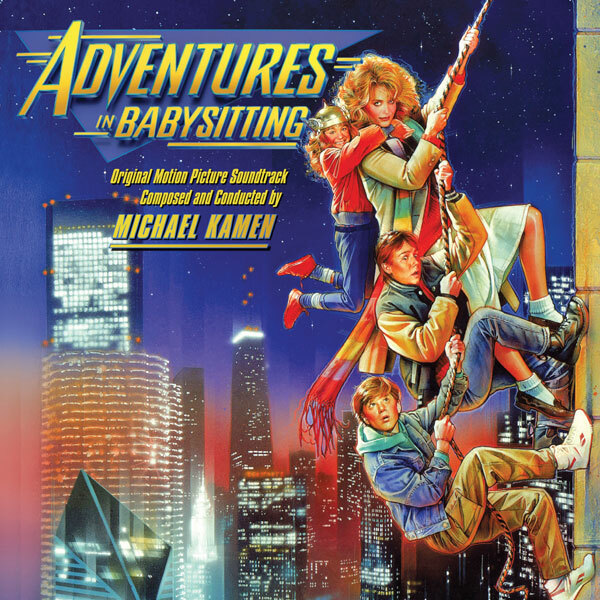 Composed the same year as Lethal Weapon, his score for the 1987 Touchstone Pictures film Adventures in Babysitting is a bit deceptive on screen -- during postproduction, several cues were dropped and many others truncated, reducing the amount of score in the finished film by a significant amount. In actuality, it is a a substantial work running roughly 70 minutes—with sessions for large orchestra held in both New York and Los Angeles. The score proper favors compact motivic gestures over drawn-out melodies. Its principal idea is a short theme associated with the heroine Chris (Elizabeth Shue), highlighting a falling-and-rising motif, while other recurring ideas include a breezy, pop-inflected line, a brassy flourish inspired by the mighty Thor, and a collection of motifs used to highlight moments of excitement, danger and distress. This premiere release of the score features all of the cues Kamen recorded for the picture in their original full-length versions, plus a wealth of never-before-heard music. Four songs important to the soundtrack appear as well, including the famous hit “Then He Kissed Me" and the show-stopping “Babysitting Blues,” in which the cast members attempting to elude their dangerous pursuers suddenly find themselves smack in the middle of a blues concert—on center stage no less. The orchestral sessions were recorded on 2″ 24-track tape and preserved in that format in pristine condition in the Walt Disney vaults. In the film, Chris agrees to a last-minute babysitting job in the Chicago suburbs. Her main responsibility is to look after Sara (Maia Brewton), a precocious 10-year-old who is obsessed with the Marvel Comics hero Thor. In the bargain, she has to deal with the clumsy advances of Sara’s love-struck older brother, Brad (Keith Coogan), and his horndog friend, Daryl (Anthony Rapp). What promises to be a relatively uneventful evening is interrupted by a desperate phone call from Chris’ best friend, Brenda (Penelope Ann Miller), who has run away from home and been stranded at a sinister downtown bus station. Chris piles the kids into the car to pick up Brenda, and the rescue attempt is derailed in short order by a series of improbable events, leading to a carjacking by an amiable young thief and their capture by the unsavory criminals behind a chopshop operation.